The 2014 NFL Preseason schedule kicks off on August 3rd, 2014 with the Hall of Fame Weekend game featuring the New York Giants playing at the Buffalo Bills. The first full week of preseason games starts on Thursday, August 7th, 2014 and runs through Saturday, August 9th, 2014. The second week’s schedule runs from August 14th through the 18th. The final week of the 2014 NFL Preseason schedule concludes on Thursday, August 28th, 2014 before the week 1 NFL football schedule kicks off on Thursday, September 4th, 2014. 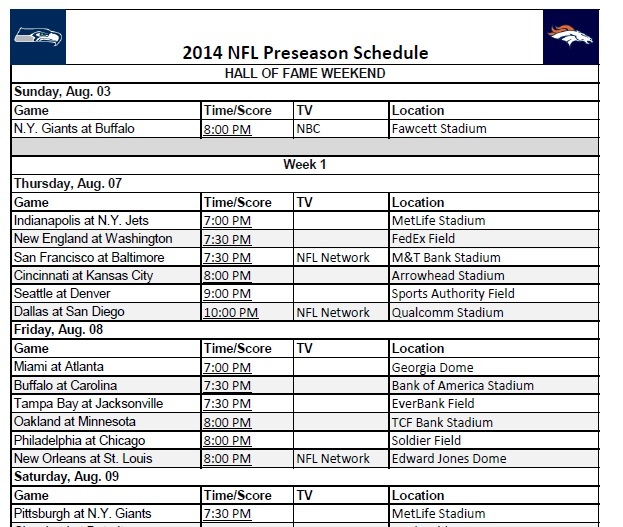 The 2014 NFL Preseason is finally here with the Hall of Fame game scheduled to kick off on August 3rd, 2014. Here is the complete preseason schedule in both printable and HTML formats for you to download, view, and print out if you choose. We also provide you with a printable NFL Preseason schedule in a printer friendly, PDF version.